Jason, an eager first-generation farmer from Conway, Massachusetts, as well as current farm manager of The UMass Student-Farm, has joined Land For Good (LFG) as its Massachusetts Field Agent. In this role Jason will help MA farmers access land, plan for farm succession, and obtain more secure land tenure – and work with farmland owners to get farmers on their land. The need to support MA farmers and farmland owners around land access and transfer is critical. Nearly one-third of MA’s farmland is expected to change hands in the next decade. (US Census of Agriculture). According to a recent study by American Farmland Trust and Land For Good (Gaining Insights), over 2,300 senior farmers in MA own a collective $1.8 billion in land and agricultural infrastructure. Only 8% of them have someone under age 45 working alongside them, but these farmers almost universally want to see their land stay in active farming. At the student-farm, Jason helps a team of students take lead of a ten-acre diversified organic vegetable operation for a full season. Jason also owns and operates Windrow Farm (Conway, MA). This land and agricultural infrastructure will change hands in one way or another over the next 10-20 years. What these farmers do with their land and other farm assets as they exit farming will shape MA’s agricultural landscape for generations to come. At the same time, access to land is a top challenge facing new and beginning farmers in MA and nationwide. Fewer young farm operators are getting on land in MA. They need support to determine their land access strategy, find and assess farm properties, and negotiate good agreements. Jason will work statewide by providing direct assistance and training to farmers, farm families and farmland owners who are seeking land, planning a farm transfer or wanting to make land available for farming. He will collaborate on projects with local partner organizations to deliver programs and assistance. Many organizations that are already cooperating in MA on land access and farm succession education, technical assistance, and policy, with LFG, include the Massachusetts Department of Agricultural Resources (MDAR), New Entry Sustainable Farming Project, Southeastern Massachusetts Agricultural Partnership (SEMAP), Community Involved in Sustaining Agriculture (CISA) and other buy local programs, Massachusetts Farm Bureau, the land trust community, and the MA Food System Collaborative. Jason has a lifelong passion for agriculture, particularly forage production and equipment operation. He owns and operates Windrow Farm in his hometown of Conway, MA, producing hay and focusing on grass-based farming systems. Growing up in a non-farming family, it became apparent to him that his land tenure path would need to be well planned, gradual, and deeply rooted in the surrounding farming community. 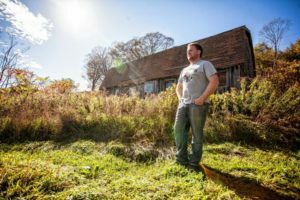 By spending the better part of his youth working for a local farmer, he acquired skills that allowed him to launch his own farming venture shortly after graduating from UMass’s Sustainable Food and Farming program. 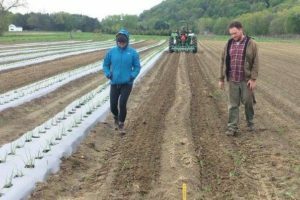 His time at UMass also led to his current role as Farm Manager at the UMass Student Farm, a year-long program that puts a team of students at the helm of a ten-acre diversified organic vegetable operation for a full season. Jason says he’s humbled by the support he receives from neighboring farmers, of all generations, and the passion his community has for young farmers who are working to keep land in agriculture. As a first-generation farmer, he has witnessed the challenges of land access and farm succession first-hand and is eager to contribute to Land For Good’s mission by serving the farmers and land of Massachusetts. 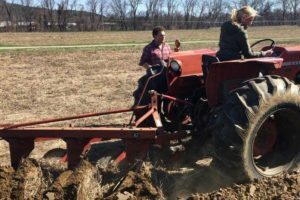 Land For Good (LFG) is a New England-wide not-for-profit organization whose mission is to ensure the future of farming in the region by putting more farmers more securely on more land. With field agents serving all New England states, LFG educates, consult, innovates and advocates with and and for farm seekers, established farmers, farmland owners, and communities. LFG is the only organization of its kind, nationally, with a sole focus on farmland access, transfer, and tenure.